Rose (Hunting) Tartan Ribbon is available to buy in 10mm (3/8"), 16mm (5/8"), 25mm (1"), 38mm (1½") and 70mm (2¾") widths, on 25 metre (approx 27½ yard) reels. The Hunting Rose Tartan Ribbon sold by tartan-ribbon.com is top quality, authentic Scottish tartan ribbon as certified by the Scottish Tartans Authority. Rose (Hunting) Tartan Ribbon is also an excellent alternative for the Scottish National Tartan. The Rose Tartan Ribbon shown here is the Modern Hunting variant. The Rose (Hunting) Tartan Ribbon is almost identical to the MacKenzie Tartan Ribbon - the only real difference is that the colours of the Rose (Hunting) Tartan Ribbon are very slightly lighter and the check appears slightly "stretched" along the length of the ribbon. 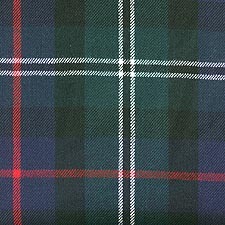 MacKenzie Tartan Ribbon is also available in 7mm (1/4") width.